Getting your heart broken is never fun, but it stings just a little more on Valentine’s Day. 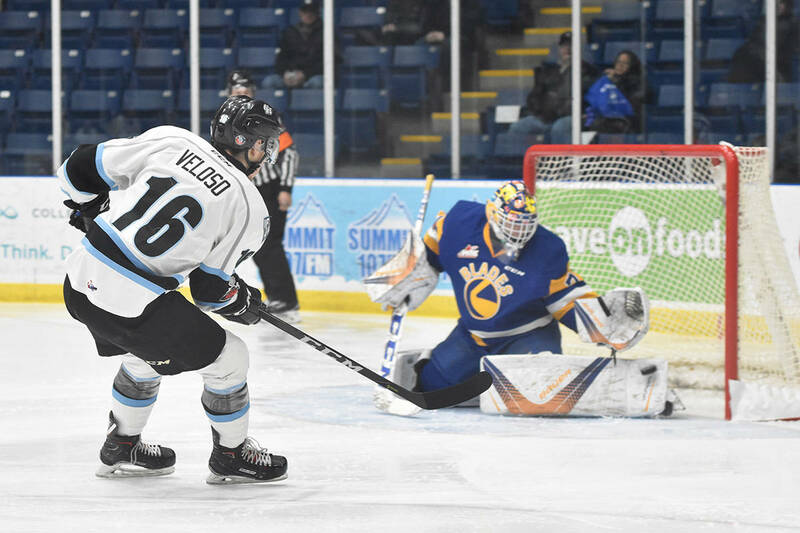 Hosting the Saskatoon Blades on Wednesday night, the Kootenay Ice were hit with Cupid’s dagger instead of his arrows. With the game tied 2-2 with less than three minutes left, an untimely turnover cost them a shot at overtime. It was the second straight outing in which the Ice had a heartbreaking finish, after giving up a third period lead against Lethbridge on Monday. It also marked the team’s third loss in a row. While the game was mostly decided by special teams, the coach thought it was an encouraging effort overall. The Ice struggled to get on track in the first period, but had the night’s first legitimate scoring chance with Peyton Krebs delivering a cross-crease pass to Colton Veloso early in the contest. Veloso put the puck on net, but was robbed by the left pad of Blades’ goalie Nolan Maier. Later on in the frame, the Blades took advantage of their first power play chance to open the game’s scoring. Although the Ice penalty killers fought admirably, with Kaeden Taphorn stealing a puck and wasting a good 15 seconds jammed in the corner with four Saskatoon players surrounding him, as soon as the Blades held possession, they buried their chance. Taking a bank pass off the wall, rookie Kirby Dach found room, and beat Matt Berlin with a perfect shot off the crossbar, and in. In the second, the Ice suffered from a lack of discipline, and let in another power play goal early. On a play assisted by Dach and Max Gerlach, defenceman Dawson Davidson sailed in a shot from the top of the circle. It was one that Patrick thought his goalie should have had. After the teams traded penalties, including a pair by Ice rookie Peyton Krebs in a holding and unsportsmanlike conduct combination, the Ice’s power play broke through. Playing 5-on-3, the team opted to put out five forwards with zero defencemen, and the gambit worked out as Brett Davis made a pass from one faceoff dot to the other and Colton Veloso blasted in a one-timer. In the third, the ice started to tilt in Kootenay’s favour as Saskatoon was not able to stay in the offensive zone at all, and the Ice started to pile up chances. Finally, while shorthanded, Brett Davis tied the game with a highlight reel breakaway. Getting sprung by Cam Hausinger, Davis backhanded a beauty top-shelf past Maier to tie the contest with less than six minutes remaining. Unfortunately, with pressure returned, the Blades jumped back on the attack. Forcing a turnover in the neutral zone, they earned a 2-on-1 and Michael Farren potted the game winning goal with another assist going to Dach. Although Kootenay pulled Berlin for an extra-attacker, and had a number of quality chances, a lack of finish caused an early end to their night. “We missed the net [too many times],” Patrick said. “[And then] when we pulled the goalie, there was twice I thought we could’ve kept it in. You need to seal the wall, if they’re going to rim a puck. That puck got by us, and when we finally did get possession, we had trouble getting pucks by their shot lane. The loss marked the team’s eighth defeat in their past nine games, and for the first time in months, jeopardizes their playoff position. While still third in the Central Division, Kootenay is now tied with the Red Deer Rebels with 51 points each. The Rebels beat the Kelowna Rockets 4-1 on Wednesday, and just like the Ice, have played 58 games so far this year. While the Ice’s recent record is not a pretty sight, according to Veloso, due to the close nature of the majority of their losses, the team doesn’t feel like they’re slumping. “Lately, we’ve been working hard, [and] doing a lot of the right things, but at the end, it just didn’t go our way,” he said. “It’s disappointing and unfortunate, but we’ve just got to keep our heads [held] high, and know that [things] eventually will go our way. The Ice return to action on Friday night to host the Tri City Americans for the first and only time this season. The Americans have 66 points and are in third place in the very strong U.S. Division. NOTES: Recent second overall draft pick Connor McClennon could be in the Kootenay lineup on Friday. The 15-year-old was recalled on Tuesday, but was a scratch against the Blades. McClennon has played two of his allowed five games as an affiliate player.